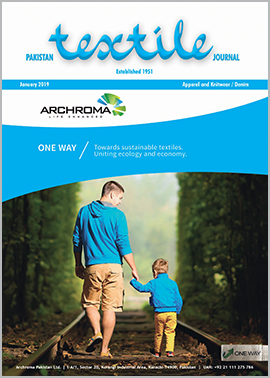 In our previous issue, we provided our readers with a compendium of the annual textile statistics and analysis that covered the last fiscal year from July 2016 to June 2017. The trends have not changed in the first seven months as compared with the same period last year. The total textile exports from July to December 2018 remained almost stagnant at US$ 6.5 million. The growth is entirely attributed to the value added sectors particularly the knitwear leading with a gain of 10.5%. The country faced extraordinary financial uncertainty in the first six months corresponding with the first six months of the new government of PTI, therefore, with dwindling foreign exchange reserves and further devaluation of 15% (PKR 121 to PKR 139 to a dollar), the orders started to come under severe price competition in the international market. The exports of raw cotton, cotton yarn and low-quality grey fabrics sectors saw a steady decline following the past trend. Home textiles witnessed a modest growth of 3.27% in the last six months despite the devaluation of Pak Rupee by more than 15%. Towel industry faced a decline of 2% in exports effectively maintaining the status quo in the first six months. The other sectors such as synthetic textiles also maintained the levels achieved last year when synthetic textiles exports had surged by more than 90% in 2016-17. The apparel sector, mainly the knitwear, has once again led the growth with a total increase of 11.39% from US$2.6 Billion to US$2.7 Billion. Remarkably, the knitwear sector accounts for 10.5% growth while the readymade garments exports remained stagnant at 0.82%. Despite an excellent performance by the knitwear sector, a matter of concern is the declining unit value by 7.7% indicating price pressure. The raw material for the knitting sector is cotton yarn which is at the moment facing declining exports and therefore a resurging knitwear sector is a blessing for the local spinners. On the other hand, cotton fabrics have also shown a decline with the exception of denim fabrics. Denim fabrics witnessed an increase of 16% in terms of quantity during last six months (268 million Sqm) and a 15% increase in terms of value (US$ 275 million July - Dec 2018-19). This amounts to almost 27% of the total fabric exports with the major share going to Bangladesh. Denim exports to Bangladesh account for 52% of the total denim fabric exports, followed by Turkey, Sri Lanka and Vietnam. As our editorials of past years had warned the spinning industry against dependency on a single market of China, we would like to ask our denim industry to remain vigilant, particularly as we hear of the new investments in denim manufacturing encouraged by the government of Bangladesh. In the first six months, exports of denim to Bangladesh increased by 20%with many leading global brands designating Pakistan as the prime source of quality denim fabrics. The high level of R&D being undertaken by the denim industry of Pakistan has allowed it to attain this strong global position. This position, however, should not be taken for granted and investment in denim garment manufacturing needs urgent attention as exports of denim jeans have matched the growth in denim fabrics. In fact, the denim jeans exports (HS Code 62034200), while remaining constant in terms of quantities from July to December 2018 (35 Million units), declined in terms of value by more than 24% resulting in the unit export value of an average pair of jeans to decline from US$ 6.0 to merely US$4.7. There seems to be severe pressure on the denim garments sector to export at a minimum price. The textile industry of Pakistan is struggling to survive facing intense global competition. The situation is far from satisfactory. The only way forward is to strive for the highest value addition through continuous R&D, brand development and marketing as well as investments in lean and efficient manufacturing facilities.